Circle’s odd choice to recast Stephen Schwartz’s musical fable in Bollywood style (but without setting it in India, or casting Indian actors) surprisingly pays off. Director Kevin Bellie of Circle Theatre, which has been on a risk-taking roll since last year’s steampunk [node:14949969 link=Urinetown;], has had the bold idea of staging Stephen Schwartz’s dated 1972 soft-rock musical as a “Bollywood spectacular.” The story is still about the son of Holy Roman Emperor Charlemagne struggling to find his place in the world, but the design elements are strictly subcontinental. 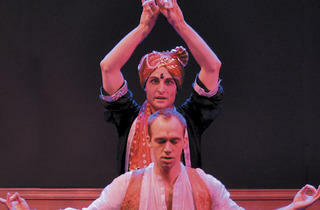 Cast members wear kurtas and saris, Peter Storms’s spare arrangements for keyboard and percussion have the plink-plonk sound of sitars, and Bellie’s exhilarating choreography looks as if it came straight from some Mumbai epic. The production can’t entirely avoid the charge of cultural tourism, especially since no one in the cast appears to be of South Asian descent. Yet Bellie partially allays this concern by using his po-mo mash-up of East, West and 42nd Street as a parallel to the way Pippin goes looking all over the place for a purpose. Significantly, the show ends with the hero stripped of cultural signifiers altogether. Not everything in Bellie’s staging works, but it’s cheeky, exuberant and never dull. 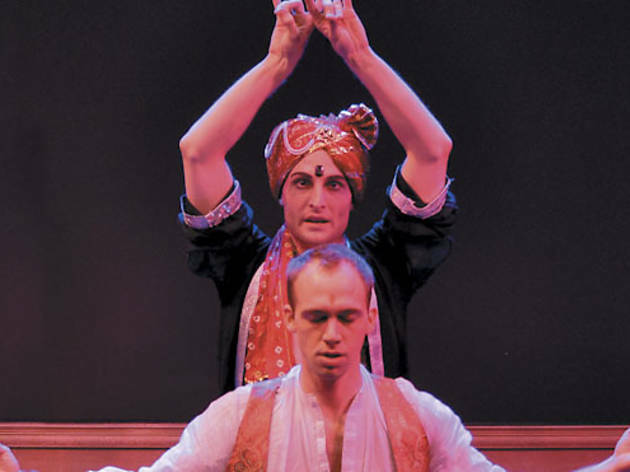 While Neil Stratman’s Pippin looks lost and uncomfortable much of the time, his unease is more than compensated for by Christopher Logan’s catlike emcee, a slinky, delightfully smarmy presence in a turban and a skin-tight pair of sparkly red trousers.